How To Choose The Right Beachwear For Women? Today, we are travelling like never before. While earlier hill stations were a major draw among tourists, beaches are swiftly making their way into many travel plans. But then, the question of what to wear when chilling at these beaches hovers in many minds. Sure, bikinis are the first and obvious choice that comes to mind. But beachwear isn’t restricted to just bikinis. Look around closely, and you shall come across a whole lot of options that are just as attractive as the bikini. But many still brush away the idea of opting for beachwear citing modesty and comfort issues. That’s precisely this article has been drafted for those who feel underconfident about their body and show them the way to beachwear bliss. Now, many factors can have a considerable effect on appearances in beachwear. But, right now, we would be focussing on the body type as it has the most direct impact on the appearance. Each body type would have their pros and cons when it comes to beachwear for women of all ages. The idea is to pick and style beachwear that plays to these strengths and avoid driving attention to the minus points. To begin with, let’s have a look at thin figures. Here’s the beachwear’s purpose would be to add some volume to your shape and appearance. Features like breast padding, cutouts, ruffles and hip ties can help in that context and create the illusion of curves. With plus-sized women, its the exact opposite. They have the curves to flaunt. The idea would now revolve around making the waist appear slimmer while playing up other assets like the hips. This can be achieved with a one-piece suit that draws the waist in or features cutouts. Feel free to play with other colours than going for the standard black. Then there are some who are heavier on the bottom. They should highly avoid excess fabric on the bottom area. Bottom heavy women should instead bring the focus towards the top. One way to do so is opting for a solid colour beachwear that has a clean-cut bottom portion with a slimming end. Top-heavy women have the option of flaunting their cleavage with plunging necklines in a one piece or in a halter-top bikini with thick straps. Now, that we’ve addressed the big concern, let’s make things easier for now. 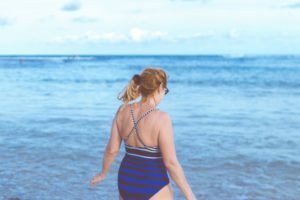 We shall do this by exploring some specific exciting style options and tips to try with beachwear for women of all ages. Bikinis are synonymous with beaches and ideal for those who get that tan under the sun. Solid colours are an all-time favourite, but experiments with floral designs are also an attractive option to try. If you find the bikini to be a bit too revealing for your taste, drape an opaque kaftan or a see-through lace maxi. Beaches aren’t only about chilling on the sand. Many look forward to a match of volleyball and other fun games. In such scenarios, one can wear a tank top over their bikini with a pair of short shorts. For a dose of fun, feel free to get tanks that feature quirky captions. For a chilled out, casual look, the striped t-shirt is your go-to outfit. The blue and white striped t-shirt is a particular favourite among many. You can choose to pair the cool tee with white crocheted shorts or go for denim and linen shorts, skirts or jeans in colours of your choice. So, there were our views on beachwear for women that works wonders on various body types and preferences. To learn about more such eye-catching styles in outfits, accessories and all things fashion, keep following InfiFashion! PREVIOUS POST Previous post: How Can Men Pick Beachwear For The Summer?